I hate having to remember stuff… so I applied some tried and tested work practices and made a home kanban board. Every day we can slide the marker below along one field (there’s two weeks shown, because 7 days aren’t evenly divisible by 2, but 14 are… :)). 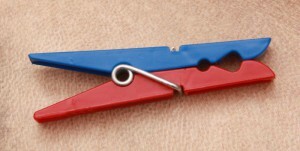 At the end of the day, all the pegs should have the colour of the day showing. In the example above, today is Monday, and it’s a blue day, and a green week. Whoever fed the dog and the fish already turned the cloths pegs around to show the blue side. Milk and bread hasn’t been bought yet (so the peg is still showing red from the day before), and the plants haven’t been watered yet this week. The board is just a piece of 3mm MDF (cardboard will do too) with a spacer on the back to give it some distance to the wall. 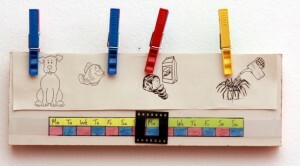 On the bottom area, make 14×2 rows, and colour them in with the four colours of the cloths pegs you have. The only complicated bit is making the slider. I used a piece of over exposed film for a nice frame, and a strip of transparent folder as the strip for it to run on. 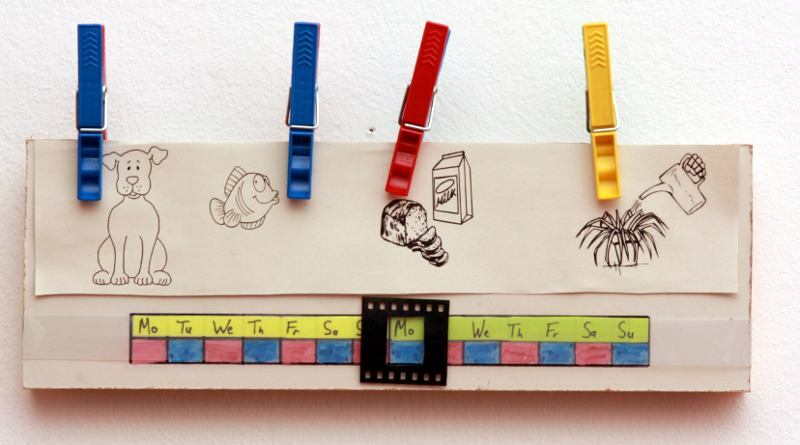 If you use something smooth for your board, you can probably get away with whiteboard markers, or just cut a piece of paper to size and write/draw your tasks on it – the handy thing about the pegs: you’ll only be turning one at a time, and the rest will hold the paper for you!